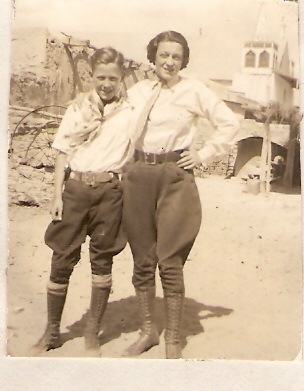 Bill and his Mother Evelyn. A picture's worth a thousand words I hear. This picture was taken in 1935 while Preston, Evelyn and Bill were driving across the country from Chicago to California, on their way to see Tom Lyle and Emery at the Villa Valentino. They had just stopped at an Indian Reservation where Evelyn bought two turquoise beaded wrist cuffs and a rawhide jacket with long fringed sleeves. I can't imagine dressing up like that on a road trip, can you? 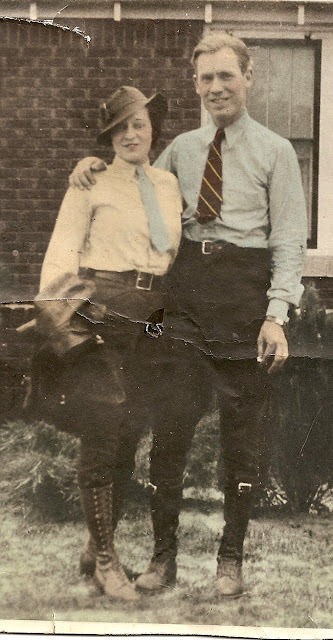 They even slept in a pup tent once or twice and yet every morning they were up at the crack of dawn and my grandmother made up her face, styled her hair and dressed like a star. This picture could easily be a scene from a movie, made on location in New Mexico... and how do you like that pose? Forever the diva!!! Evelyn was a stickler for perfection and even altered her son Bill's shirts and pants if they didn't fit just right. The two of them kept up that standard of style and panache until the day they died and if I faltered in any way or looked less than perfect - I'd have to hear about it. How could anyone keep up that level of perfection on a daily basis? you'd have a heart attack! - But the Williams were like that and always had "The Right Look," for every occasion. What happened to Glamour, Style and the Confidence to dress to the teeth? I guess that's an American tradition that can only be enjoyed in vintage photos now. I love this picture of my grandparents Evelyn and Preston Williams. You'd think they were Marlene Dietrich and Jimmy Stewart taking a break between scenes. And they were on a long road trip for heaven sakes ! Today people wear t-shirts, shorts and flip-flops, no makeup and their hair going every which way, but in 1935 it was Showtime everyday and "People- Watching" was a national past-time, like the Macy's Day Parade. Yes, those wonderful Maybelline Days when it was cool to look beautiful, dress with style and make-up those Maybelline Eyes. The day my 82 year old father, Bill, fell and hit his head, having to have two brain surgeries and ultimately dying, he walked into the hospital looking like two million bucks and when the nurse said, "are you ready to go Mr. Williams," he simply winked at her and said, "OK BABY! Charm, Wit and Style right to the end. The Maybelline Story and the Spirited Family Dynasty Behind It at http://www.maybellinestory.com/.